The Cranbrook Art Museum in Bloomfield Hills, north north west of Detroit, is currently exhibiting called “Warhol on Vinyl – The Record Covers 1949-1987”. This is the first comprehensive exhibition of Andy Warhol’s record cover art since the Montreal exhibition “Warhol Live!” in 2008. Of course, many record covers with art by Andy Warhol have been unearthed since that exhibition thus making the Cranbrook show essential viewing for anyone interested in this aspect of Warhol’s oevre. 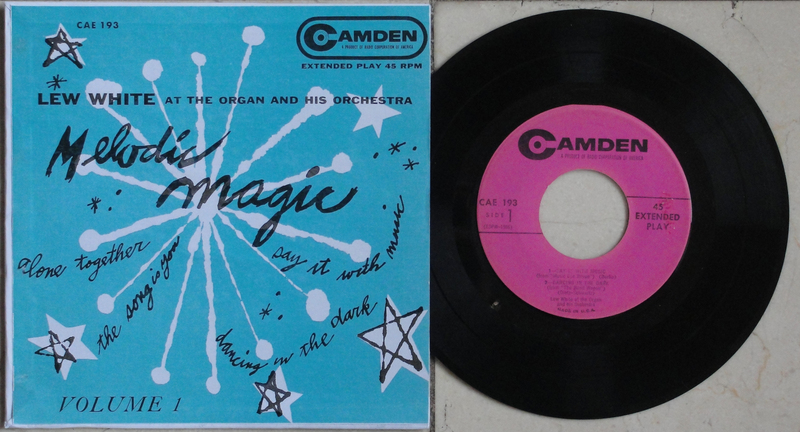 Included in the Cranbrook exhibition are such recently discovered covers as Lew White’s “Melodic Magic” EP on the Camden label. Lew White’s EP “Melodic Magic”. 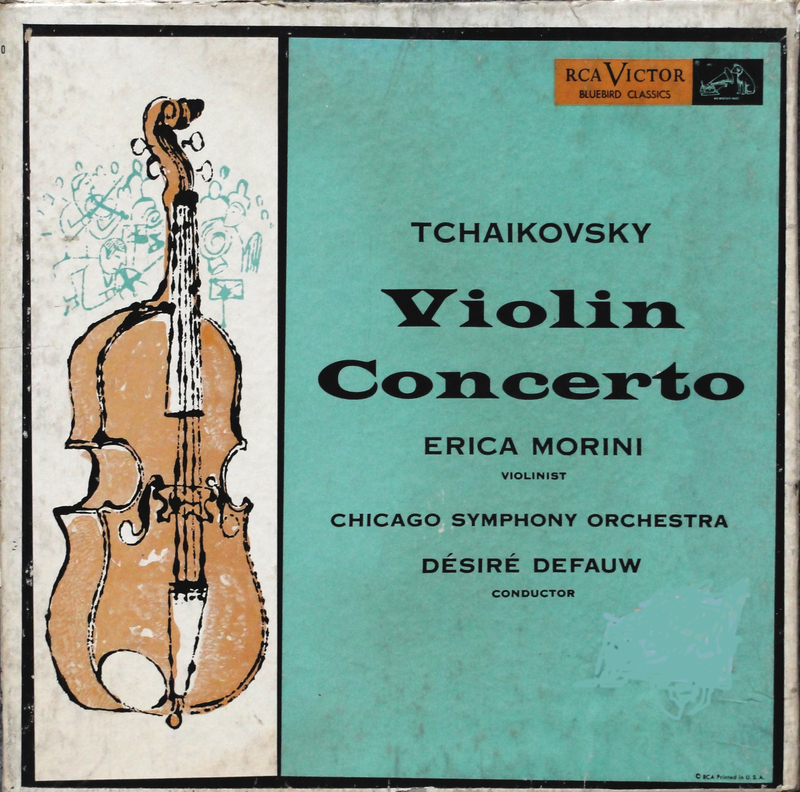 Others include two LP covers on the RCA Victor Bluebird label; Tchaikovsky’s Violin Concerto, and “Porgy & Bess / Grieg’s Symphonic Dances which join the Byron Janis recording of “Rhapsody in Blue” as being acknowledged Warhol covers. 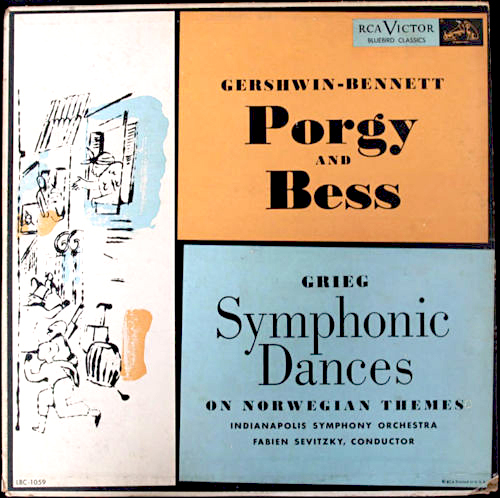 Cover of the “Porgy & Bess / Symphonic Dances” album. 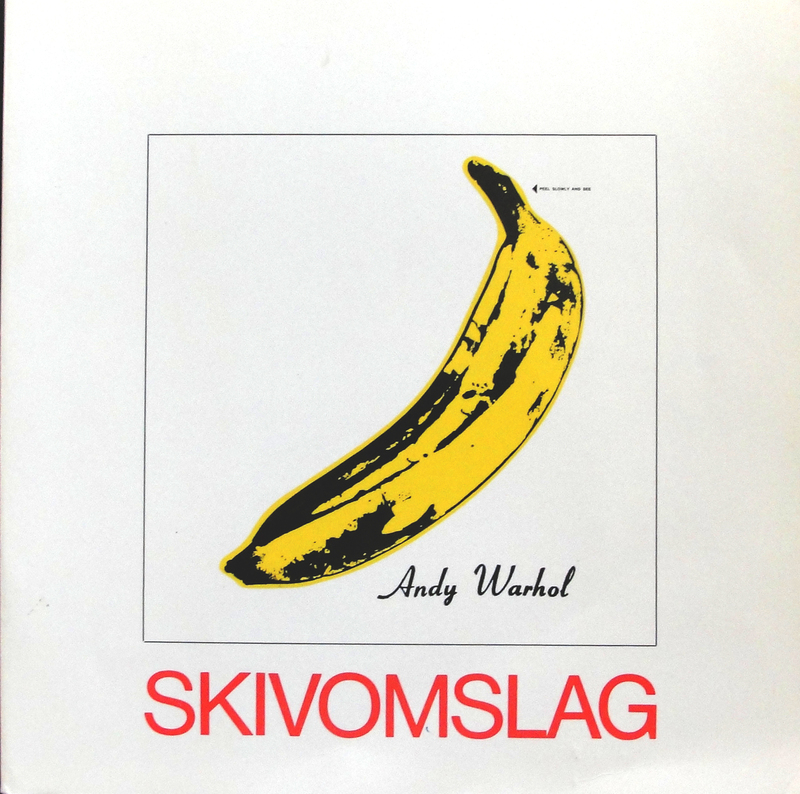 A number of bootleg albums that use Warhol’s art were also included including three Velvet Underground boots: “Screen Test: Falling in Love with the Falling Spikes”, “NYC” and “Orange Disaster”, The Rolling Stones’ “Live in Laxington”, Mick Jagger’s “Suntory D R Y Beer”. 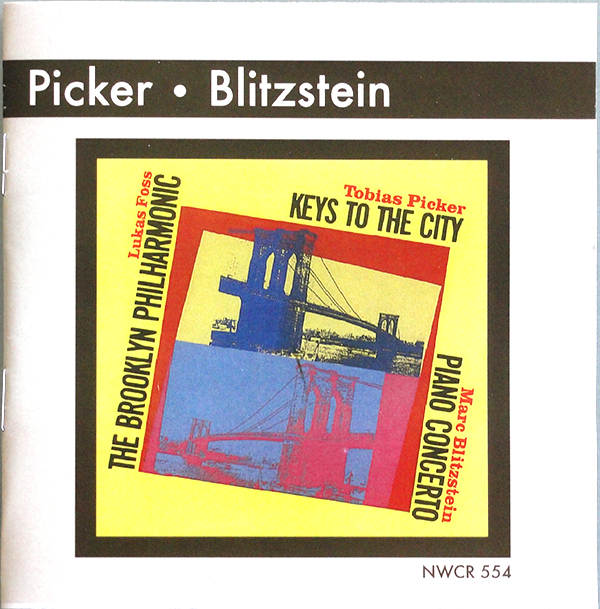 The re-issue cover for the Picker-Blitzstein CD. 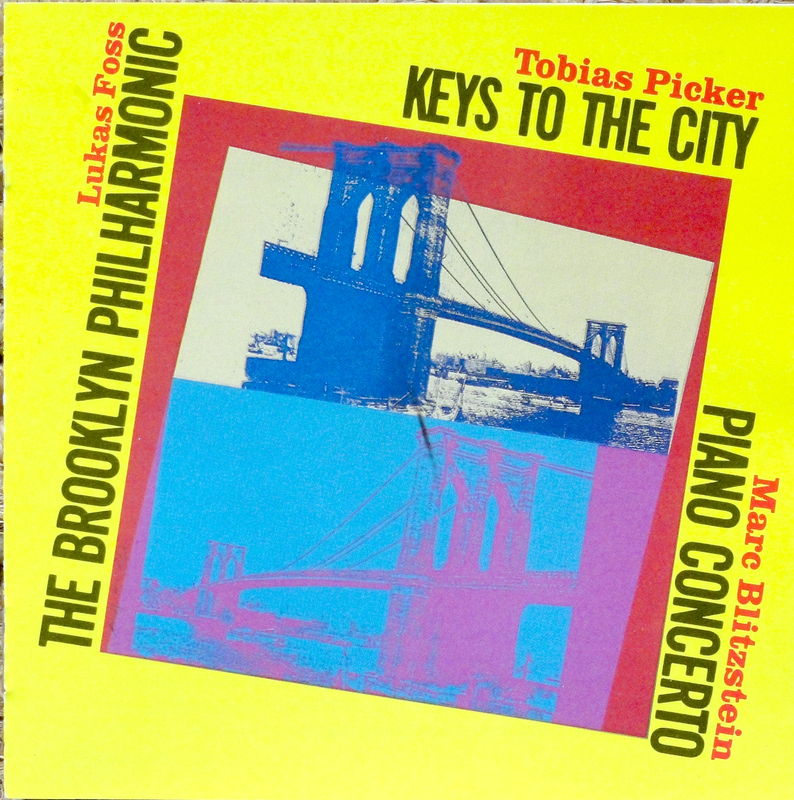 The original cover image for the CD on the CRI label. And I also found an unusual CD of a classical concert including Mozart’s “Marriage of Figaro” and “Prague Symphony (No. 38)” performed by the NHK Orchestra on one disc and Mahler’s “Symphony No. 5″ on the second, released by an organisation called NTT Data. The cover had an intriguing Warhol drawing on the front and on each CD that I could not resist. When I showed photographs to members of The Warhol Cover Collectors Club they could identify the drawing as one from a series that Warhol did in a book for ‘Play Book of You S. Bruce from 2:30-4:00”. It was a very special portfolio because only 1 copy was made. Subject of all portraits is Stephen Bruce, the owner of the Serendipity restaurant in New York where Warhol used to hang out a lot in the Fifties. He must have had a crush on Bruce, because he made this drawings supposedly in one night, in ballpoint pen and offered Bruce the portfolio. The portfolio was sold at Sotheby’s in 2010 for £181.250 [Thanks to Guy Minnebach for this information]. There is book of the drawings as well. 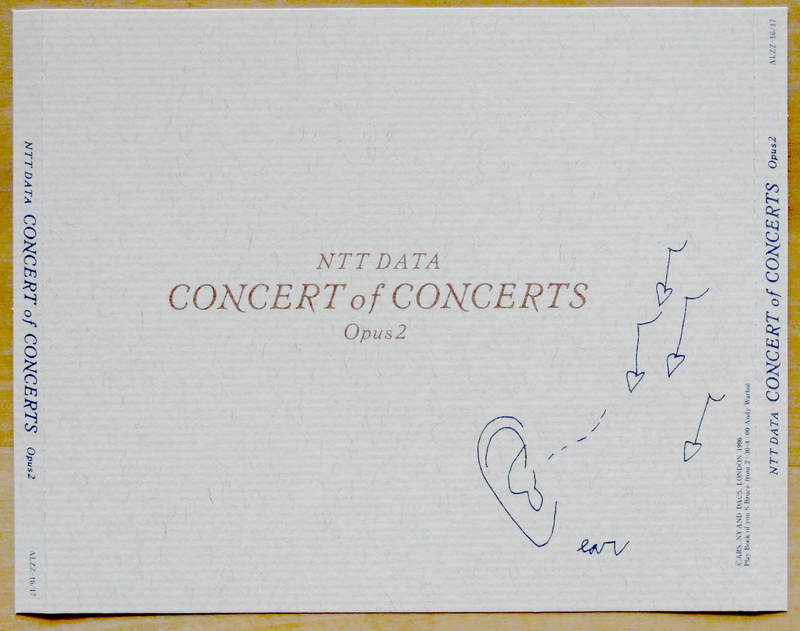 NTT-Data “Concert of Concerts, Opus 2” CD cover. 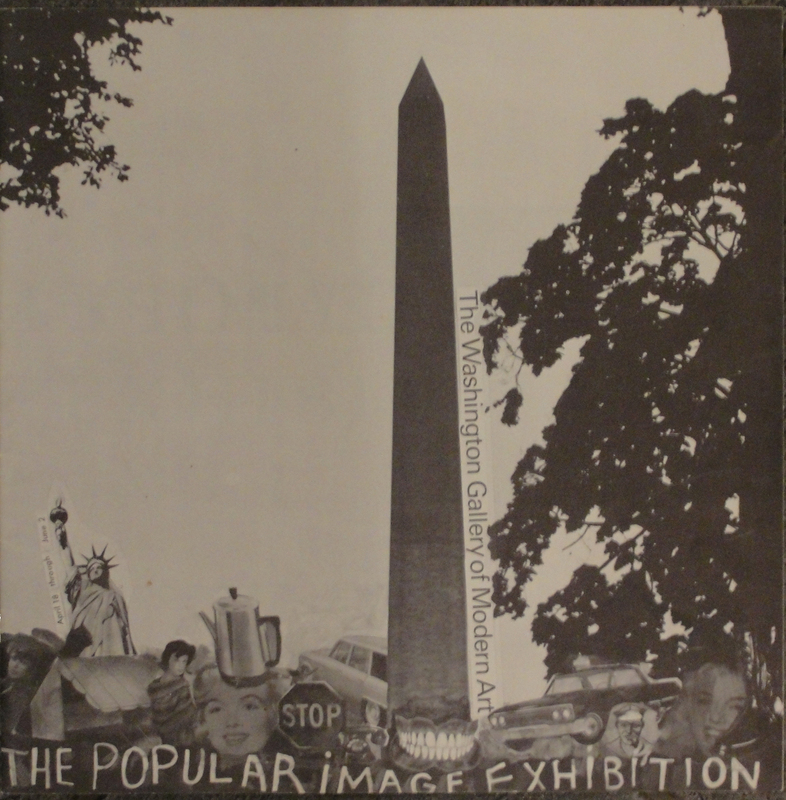 The Washington Gallery of Modern Art put on The Popular Image Exhibition between April 18th and June 2nd 1963. Eleven artists were represented including Claes Oldenburg, Jasper Johns, Robert Rauchenberg, John Wesley, Tom Wesselman, Robert Watts, James Rosenquist, Vern Blosom, George Becht, Andy Warhol and Jim Dine. 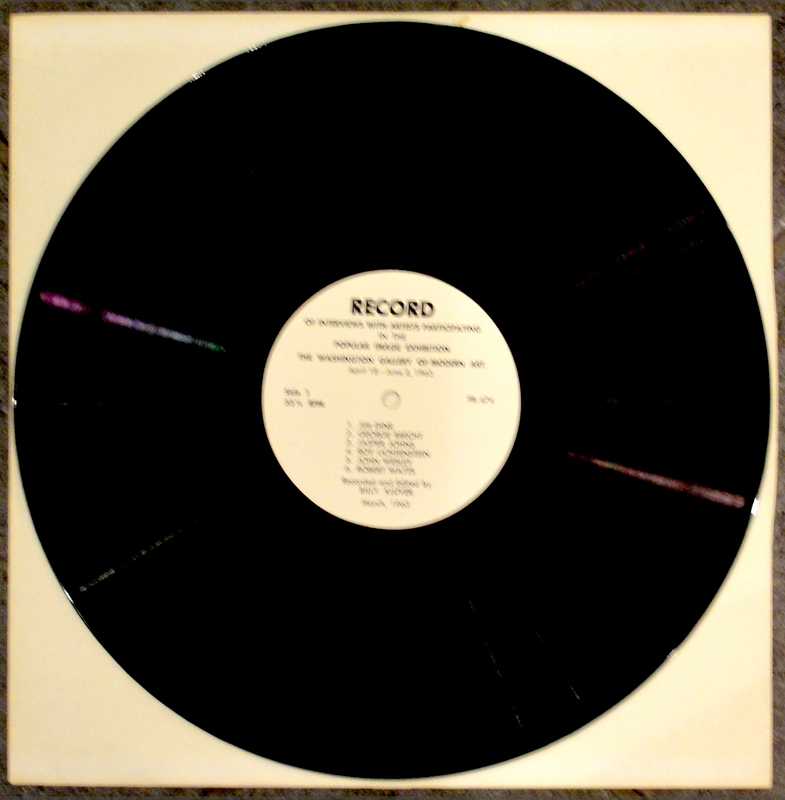 Billy Klüver, Swedish engineer turned art director, recorded interviews with all eleven artists during March 1963 and edited the inerviews, which were subsequently released on an LP record. The record was housed in a plain whitepaper inner sleeve together with the exhibition catalogue and these were sold inside an envelope. 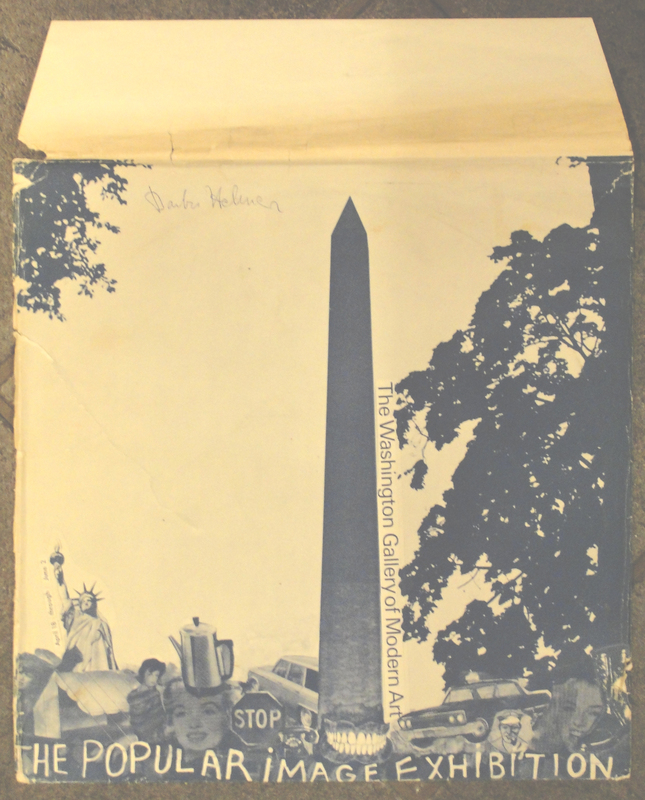 The cover image on the catalogue and the outer envelope was designed by Jim Dine. The image on the envelope was printed in a shade of blue n a white background, while that on the catalogue cover was printed in black on a white background. According to the catalogue, Andy Warhol was represented by ten oil paintings on canvas. There is no mention of his “Giant Size $1.57 Each” record sleeve. So how did the exhibition record come to be sold in this new Warhol designed and produced cover? Were there records over after the exhibition that were put into new covers. or did Billy Klüver have a stock of records without covers that he felt needed new sleeves? Whichever was the case, he appears to have asked Andy Warhol to produce a new cover, resulting in the screening of the “Giant Size” cover. Neither Andy Warhol (who died on 22nd February 1987) nor Billy Klüver (1935-2004) are alive today to relate the true history of the Popular Image Exhibition record and the “Giant Size $1.57 Each cover. I’ve divested myself of the majority of my concert and art posters but have kept a few that I particularly like. When I sold my record and poster collection, the buyers, knowing that I collect Klaus Voormann’s record cover art promised me a signed, numbered edition of Klaus Voormann’s portrait of John Lennon. I collected it the other day. 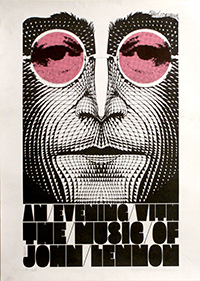 Signed limited edition poster: An Evening with Music of John Lennon. It joins my signed Banana poster from 1981-2. Nationalmuseum in Stockholm presented a huge exhibition of record cover art from 27th October 1981 – 17th January 1982. This was the year before the CD was introduced so all covers were of vinyl releases. I still have the exhibition catalogue from the Nationalmuseum’s exhibition – which has the Velvet Underground & Nico LP design on its cover. The catalogue has an eight page review of Warhol’s cover art and pictures six covers (two Kenny Burrell, one Johnny Griffin, Two Rolling Stones and – the obligatory – Velvet Underground & Nico) written by Bo Nilsson. This must be the first anaytical review of Warhol’s record cover art that I ever read. Of course, only a few warhol covers were recognised in 1981, so the choice of these six is hardly surprising. I felt that the covers in the exhibition were arranged rather haphazardly and I wrote a three-page letter to Nationalmuseum suggesting how the covers could have been better presented. I did not expect a reply, but one came by return informing me that the exhibition was moving to Umeå’s Bildmuseum and that the museum would contact me to discuss which covers should be included. They did, too! and about thirty of my covers were included in the Umeå exhibition. Catalogue from Nationalmuseum’s exhibition of record cover art. Theposter from Stockholm’s Nationalmuseum’s record cover art exhibition 1981-1982. 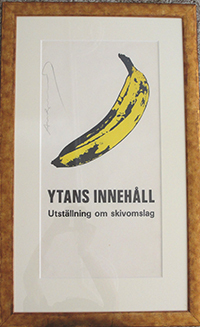 In 2008, as discussions about putting on the “Happy Birthday Andy Warhol” exhibition in Piteå were underway a copy of the poster for the Nationalmuseum’s record cover exhibition came up for sale. This was a one-off and beautifully signed by Andy Warhol in pencil. So it was included in the Piteå exhibition and has since then hung on my wall.